A six-year $3.4 million test of the SafeCare model of treatment for the prevention of child abuse and neglect involving 2,175 parents reduced the number of children going back into Oklahoma’s child welfare system from 70 to 50 percent, according to this post by April Hill on KRMG.com. 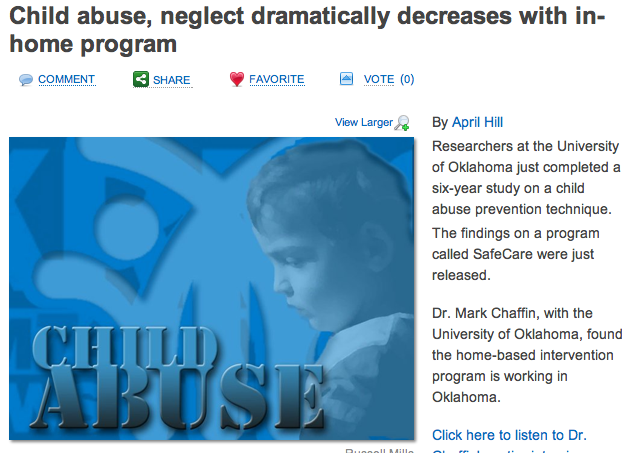 Dr. Mark Chaffin, psychologist and professor of pediatrics at Oklahoma University’s College of Medicine, said that all home-based programs in Oklahoma have switched to the SafeCare model. According to the National SafeCare Training and Research Center site, the program is aimed at families with children under 5 years of age. The study is published in the March issue of Pediatrics, and is available at no charge online.